Baqend uses a combination of CDN and client caching using a Bloom filter-based data structures called Cache-Sketch. This enables Baqend-based applications to use not only CDN caches but also expiration-based caches — in most cases the browser cache — to cache any dynamic data. But wait! What do you do with all the data which is loaded and changed by your application at runtime? Changing user profiles, updating a post or adding a new comment are seemingly impossible to combine with the browsers cache, since you cannot estimate when such updates will happen in the future. Therefore, caching is just disabled or very low TTLs are used. We have researched and developed a solution where we can check the staleness of any data before we actually fetch them. At the begin of each user session the connectcall fetches a very small data structure called a Bloom filter, which is a highly compressed representation of a set. Before making a request, the SDK first checks this set to know if it contains an entry for the resource we fetch. An entry in the set indicates that the content was changed in the near past and that the content may be stale. 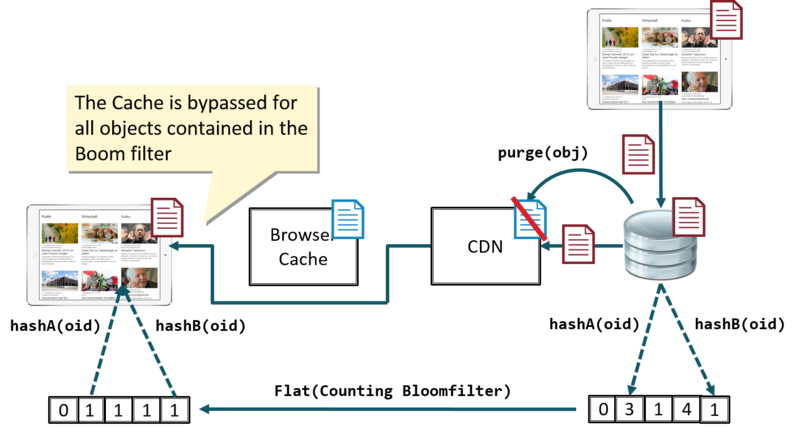 In such cases the SDK bypasses the browser cache and fetches the content from the nearest CDN edge server. In all other cases the content is served directly from the browsers cache. Using the browser cache saves network traffic, bandwidth and is rocket-fast. In addition, we ensure that the CDN always contains the most recent data, by instantly purging data when it becomes stale. The Bloom filter is a probabilistic data structure with a tunable false positive rate, which means that the set may Indicate containment for objects which were never added. This is not a huge problem since it just means the we first revalidate the freshness of an object before we serve it from the browsers cache. Note that the false positive rate is very low and it is what enables us to make the footprint of the set very small. For an example we just need 11Kbyte to store 20,000 distinct updates. There is lot of stream processing (query match detection), machine learning (optimal TTL estimation) and distributed coordination (scalable Bloom filter maintenance) happening at the server side. If you’re interested in the nitty-gritty details have a look at this paper or these slides for a deep-dive. Note: Caching is active for all CRUD operations by default. Query Caching is currently in beta, if you would like to test it please contact support@baqend.com. Any new page load will always return the newest data (a fresh Bloom filter is fetched). While the app is running you can allow a configurable maximum staleness to make optimal use of the browser cache. This does not mean that you will actually see any outdated content, it just provides you with an upper bound that is never exceeded. Maximum CDN staleness: this is the staleness bound for all new clients (i.e. that have not cached a Bloom fitler, yet). The default setting is to only do micro-caching of 1 second. This incurs 1 second of staleness at the maximum and protects the server from excessive load under high user volumes. Maximum total staleness: defines the maximum staleness seen by the client (CDN staleness + client cache staleness). Internally the client makes sure to update the Bloom filter, when it gets too old. Tip: You can increase both staleness settings, if your application is under very heavy load. This saves you requests and prevents scalability bottlenecks if you are in the free tier.